BRISTOL, ENGLAND (June 25, 2015) — Our little geological exploration of southern Britain now passes into England. Tim Palmer and I crossed the River Severn and drove to the Cotswolds to examine old quarry exposures and Medieval stonework. 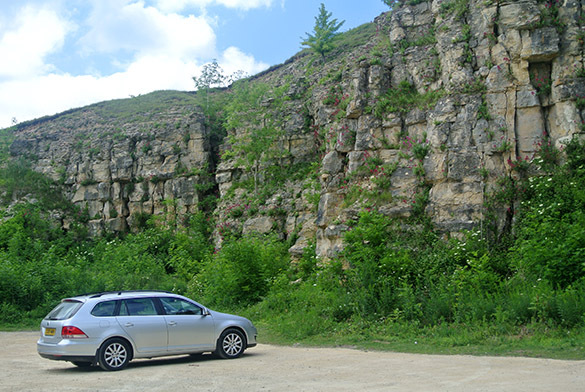 We are parked above in Salterley Quarry near Leckhampton Hill. Our theme again is Jurassic. At Leckhampton Hill we examined exposures of the Middle Jurassic Inferior Oolite. It is not, of course, inferior to anything in the modern sense. 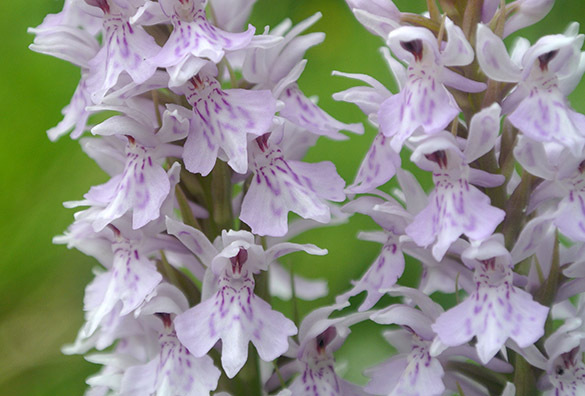 The name, originally from William Smith himself, refers to its position below the Great Oolite. 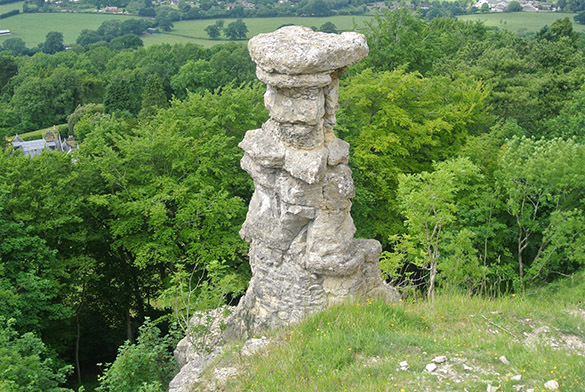 This is Devil’s Chimney, a remnant of stone left from quarrying in the 19th Century. We stopped along a bend in a Cotswold road called Fiddler’s Elbow and found an old carbonate hardground friend in the Inferior Oolite. Borings are evident in this flat, eroded surface. 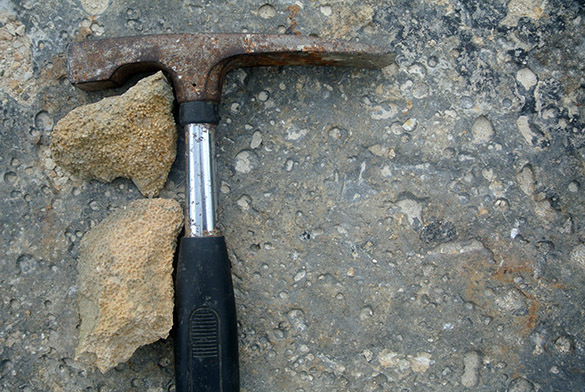 Next to the hammer are pieces of the Pea Grit, a coarser facies. I want to examine the grains for microborings and encrusters. 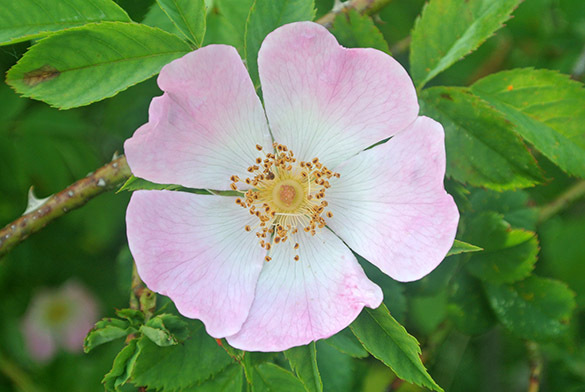 This is the gorgeous dog-rose (Rosa canina, not surprisingly), which is common in the Cotswolds. It is the model for the Tudor Rose in heraldry. 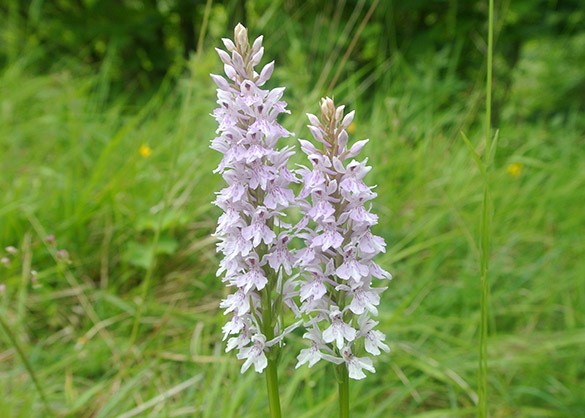 These tall orchids were also abundant near our outcrops. At the end of the day we stopped by St. Mary’s Church in Painswick, with its distinctive churchyard and variety of building stones. The sculptured trees are English yews. 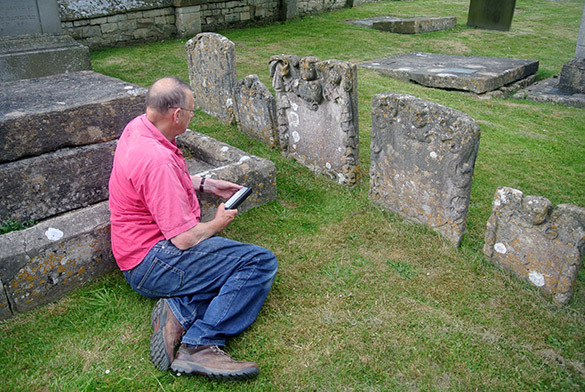 The gravestones date back to the early 18th Century, with older ledger stones inside the church. 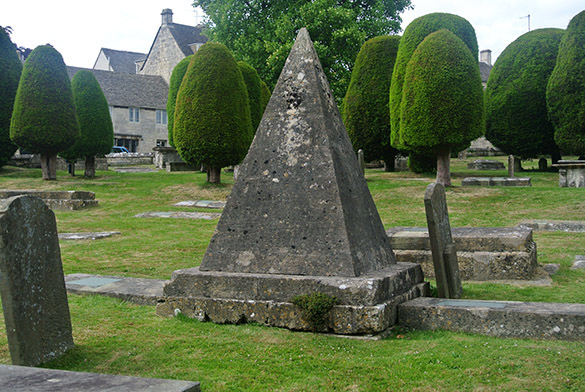 The unique pyramidal tomb of the stonemason John Bryan (1716-1787). He was apparently responsible for most of the 18th Century ornate monuments in this churchyard. 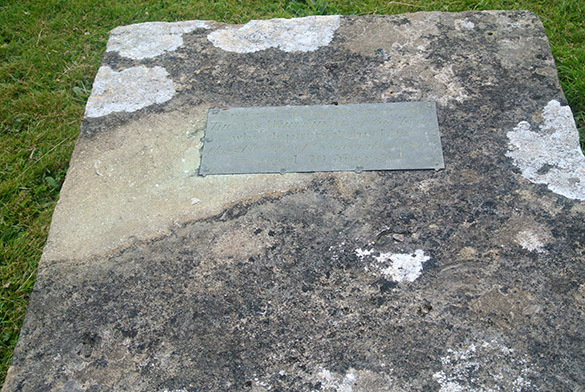 Many of the gravestones have copper plates affixed to their upper faces. The rain washes copper ions out of the metal and over the limestone, killing the lichens and other encrusting organisms. This leaves the lighter patch of bare limestone. Somewhere in this is a study of microbiome ecological gradients! 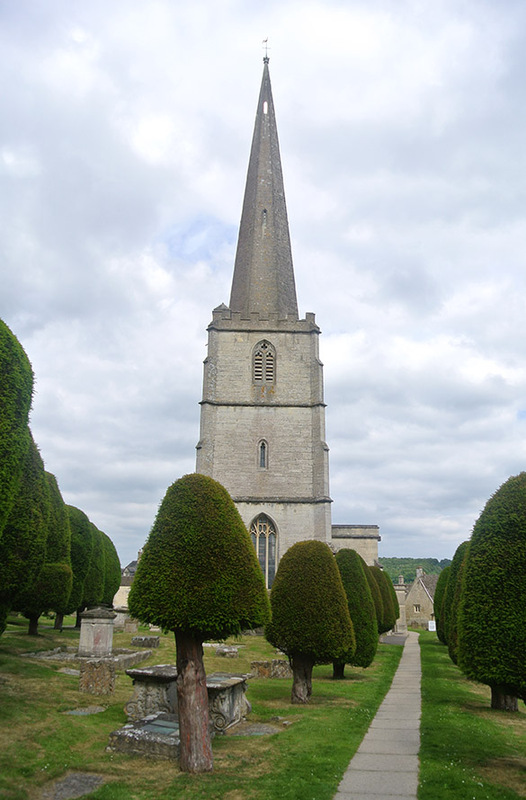 The Painswick church was the site of a 1643 battle during the English Civil War. 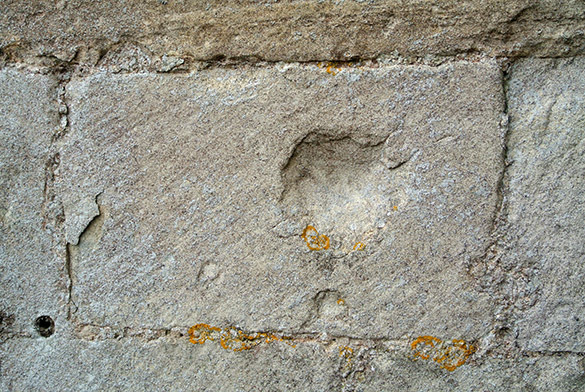 There are numerous bullet and shot marks on the exterior stones. Tim commented on the remarkable resilience of this stone to stay coherent after almost 400 years of weathering of these pits. 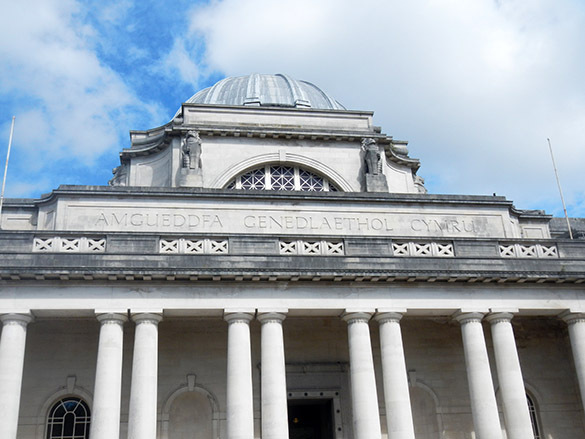 BRIDGEND, WALES (June 25, 2015) — On our last day in Wales, Tim had an errand at the National Museum Wales in Cardiff. 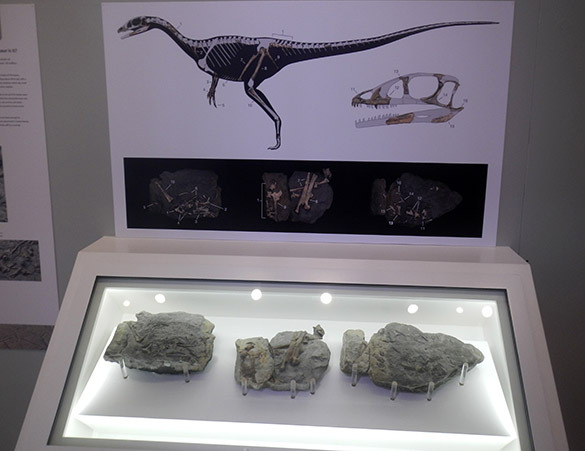 We took the opportunity to visit their new dinosaur exhibit with the skeleton that had been collected from an outcrop we visited earlier in the week at Lavernock Point. The exhibit is well done. 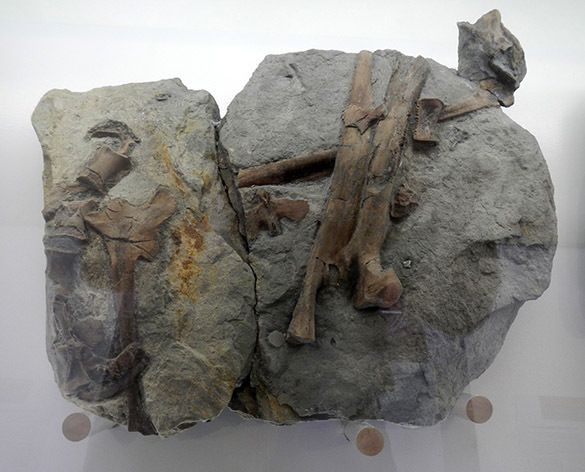 The fossil skeleton represents the first carnivorous dinosaur found in Wales, and one of the earliest Jurassic dinosaurs found anywhere. Here are some of the bones in lower Lias limestone. 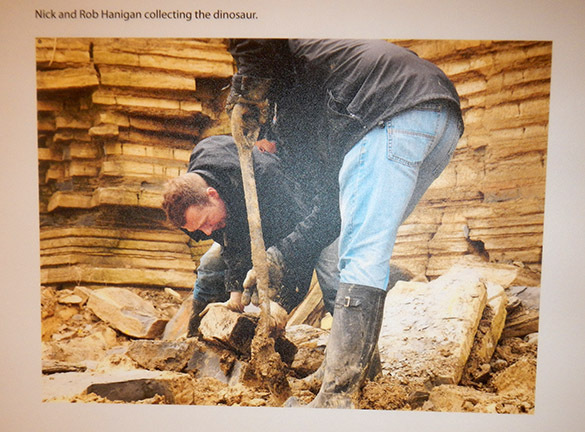 This is a museum photo of the dinosaur collecting site. You may recognize the place from a previous post in this blog. 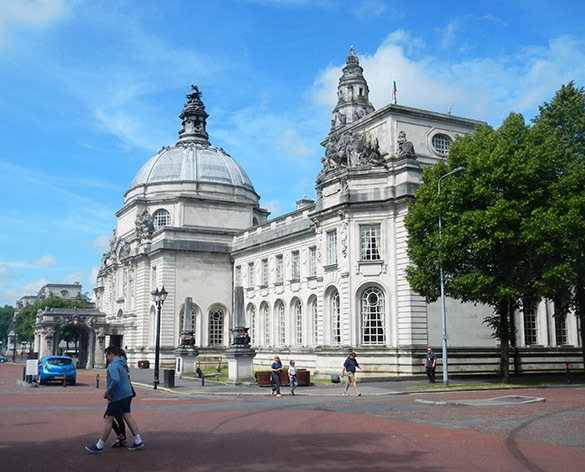 This is Cardiff City Hall. I loved the early 20th Century architecture in this Cardiff district, but we didn’t have time to explore. It is now off to southern England for more fieldwork.